Los Angeles Lakers great Magic Johnson is one of the greatest players to ever step on an NBA court. He revolutionized the point guard position being that he was 6’ 9”. Magic was one of the marquee players in the 1980’s that lifted the NBA to the forefront of sports. His NBA accomplishments speak for themselves as he was named one of the 50 greatest players in NBA history in 1997. His success (5 NBA Championships, 3 league MVP’s) as the face of the Lakers organization and the NBA lead to his induction to the Naismith Hall of Fame in 2002. Magic Johnson is the latest in a short line of great athletes to be honoured with a unique 'Tegata' memorabilia piece. Utilizing handmade Japanese Hamada paper, Johnson has inked his right hand in black and included an authentic Inkan stamp which aligns with the traditional craft. 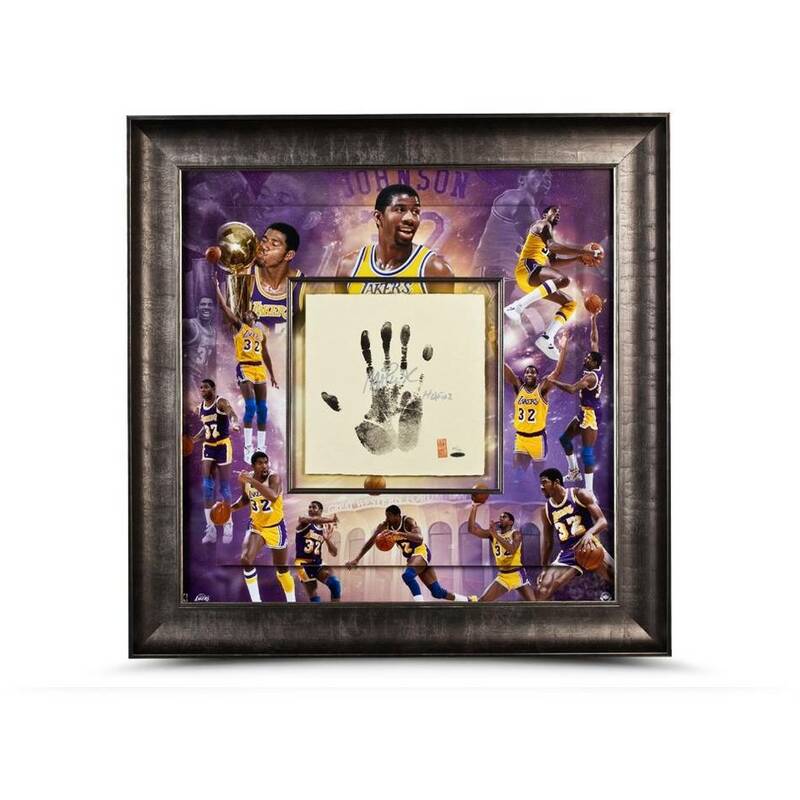 The overall keepsake, which measure 36" wide by 36" high, includes a 9.5" by 10.5" inset center upon which Johnson hand has been inked and is surrounded by a double-matted collage style background of Los Angeles Lakers images. Johnson performed the ‘Tegata’ process under supervision of UDA officials and helped in the hand-crafting of 32 uniquely authentic stamps for the debut release. The limited-edition silver autographed and inscribed “HOF 02” inscription hand print is guaranteed authentic by virtue of Upper Deck Authenticated’s Five-Step Authentication Process.